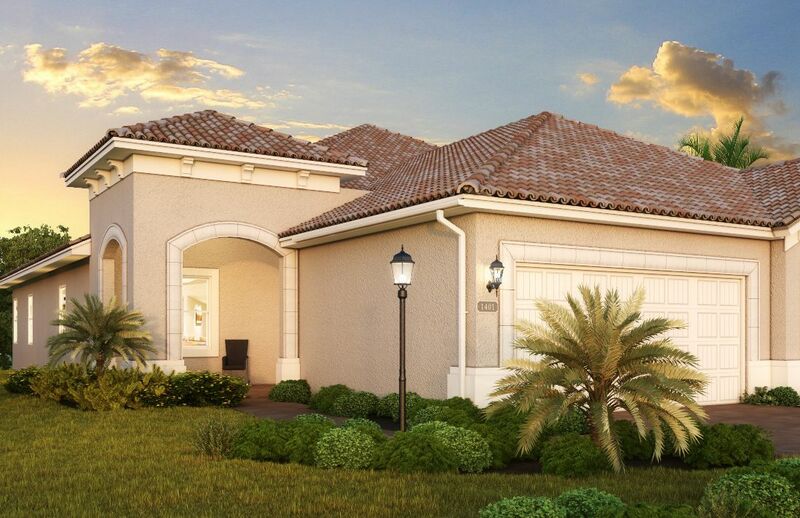 Mirabella is an innovatively designed neighborhood, nestled in the heart of Village Green, one of West Bradenton’s most sought-after communities. It features resort-style villas that are LEED, ENERGY STAR, and HERS certified. In fact, these are the first LEED certified villas in Florida, earning one of the highest LEED level. And they have earned a super efficient 62 to 64 on the RESNET HERS Index, as well. With its ideal location, beautiful climate, and laid-back atmosphere, Mirabella is the perfect setting for a gated “active lifestyle” community designed just for residents 55 and over. What is an “active lifestyle” community? Simply put, it means residents have the luxury of living and playing in a neighborhood designed with their enjoyment in mind. Pursuing a healthy lifestyle at the fully-equipped fitness center… Joining their neighbors in the lounge area for bridge games, crafts, book clubs and potlucks… Swimming laps in the pool… Enjoying a cookout with friends… Hanging out in the fenced pet park while their four-legged friends romp and play. We designed Mirabella to foster close-knit relationships, to offer a true sense of community. IMG Academy Golf Course access for our residents and future buyers! Several great places to dine, including - Pier 22, Bonefish Grill, Motorworks Brewery, The Lazy Lobster and many more!